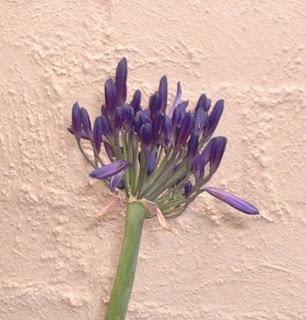 This is my black agapantha - really a deep purple - but this is the first flower and it is taking forever to blossom out. We have had lots of glorious rain today - sunny and blue skies and all of a sudden the heavens open and down she comes. Wonderful stuff indeed. Book progress (lots of you keep emailing and thanks for the support - and push...) - we are up to the page numbering and cover choosing. It is a bit like giving birth to a pile of babies in a long drawn out manner rather than a quick push - not that I had those. Other major excitement is that we have a new computer - Bruce got a Mac and we got a more modern and much cleaner black keyboard as well. New computer is faster by far - I was turning on the computer and going off down the road to get the newspapers and then coming back and hoping something had happened. Now it is all zip zap. Only thing is Mozilla went with my huge pile of favourites so I will have to slowly refind them. 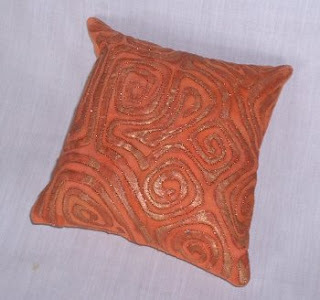 This is another shiva rubbing on white polycotton sprayed with Colourwash in terracotta and made into a little pillow of no consequence. Stitched with metallic thread on the machine this time. At last back to some machine stitching she cries. I am going to make about 8-10 for this article I am writing. Many men working outside doing the preparatory work for the underground power. It will be wonderful when it finally arrives - all that visual pollution gone. Our electricity bill was down this round - means that we are doing our little bit for the planet or that we didn't have the air con on as often this summer. I have very powerful lights in the studio and need to have a big notice reminding me to turn them off when I leave. We are having a lovely Sunday - we went for breakfast at the new cafe around the corner - Lincolns - and Ian has beavered on the book most of the day - just reading it through with a tooth comb now and thinking about what might go on the cover. I have played with my banner and made the words so you can read them for starters. It has rained buckets from time to time during the day. 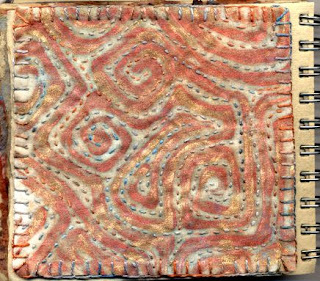 I have machine stitched one of the rubbings to make a little pillow for an article in Aust Machine Embroidery on using Shiva stiks and added some more things to my Rust and Stuff journal. We have had a feast of rugby this weekend now that it is at the business end of the Super 14s. All of the Canberians will be delighted with the win over the Crusaders last night. Next weekend will be most interesting indeed. as you can see, I am working on adding a banner - problems at this stage as I have to work out how to make it so I can read the words and how to make it fit. I could take it off but having it there will remind me that I need the challenge of changing it! The piece of work is something I made for City and Guilds - the creation of a fabric - and I do love it. 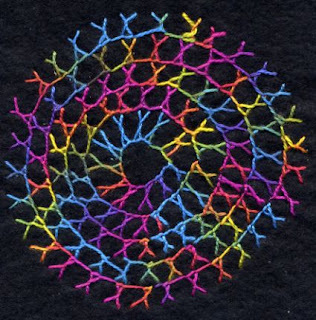 This is my running stitch sample. Running stitch is one of my favourites and I use it a lot often in rows over a surface. 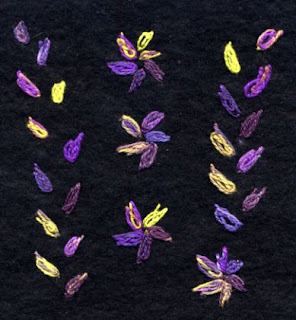 Jean Draper inspired me many years ago with her Indian embroideries where she used running stitch. This is a shiva rubbing over the curves rubbing plate on white polycotton over which I have sprayed Moonshadow Mist. 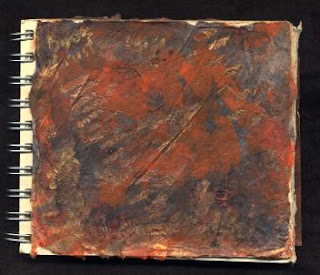 Another page for my sketchbook. Real feast of rugby last night as the Super 14s get near the end. My beloved Hurricanes just beat the Highlanders although naughty Tana spent 10 minutes in the sin bin and Jason Eaton damaged his knee. Not good. Then the Chiefs beat the Waratahs - that was a good game and the evening finished with the Force cleaning up the Cheetahs. Today we will see how the Brumbies go against the Crusaders. Lovely day today - we have a new cafe - Lincoln's - just around the corner - we had a cup of excellent coffee yesterday - we are a bit spoilt for choice around here just a few steps away. 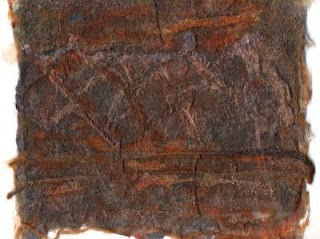 I have been playing with the Cedar Canyon rubbing plates and Shiva stiks - this is one of the Curves ones. 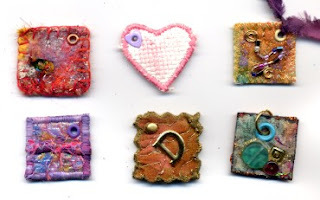 They are really fabulous for rubbings - great deep etched surfaces. Working on my rust and stuff I have used copper, orange and gold on black polycotton. 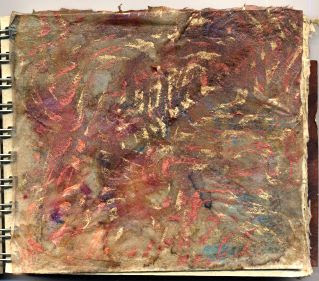 Here I have used the tissutex from previous (the Moonshadow mop up piece) and worked rubbings with the three Shivas but moving the rubbing plate around underneath. I have sprayed a bit more of one of the blue Moonshadows over the surface. 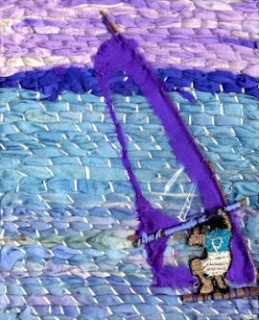 I am working on a stitched piece which I will post tomorrow. People are always emailing complaining about my photo so I have made a real effort and had a variety of 'smiley' ones taken. Hope you like my new pic - I am not good at smiling for photos so I shall practise from now on. The Tattoo is on at our park Friday and Saturday and we have been entertained with the rehearsals for the past three nights. Very enjoyable. Val and Jim have spent 3 weeks cruising around parts of the eastern states - started and finished in Melbourne. They went up as far as Coffs Harbour I think and down to the south of NSW - we followed their trip on the map and I saw all those towns where so many of our customers live. Maybe one day we should go too - they said it was lovely country. I put the washing out on the line and got the rain going. Wonderful - must try it more often. I was going to photograph the first flower on my black Agapantha this morning but all too lateas the rain dropped down in bucket loads. It is going to be a glorious colour though and I have three plants all in a row. Even though it is autumn, the basil is still growing prolifically and tastes yummy. We are very busy and in every spare moment Ian is doing the final layout of the book. We are pleased with the way it is falling together - I should say pulling together as things fall apart but you get the drift. However everything takes so much longer than you think it should but we are getting there. We have so many new products waiting patiently in a growning pile to go on the web - all of a sudden they will appear and then you will know the book has gone to the printers. Rae and Jacinta have sent me wonderful fabrics and new yarns in the Opulent range. Muslin, silk organza and velvet today and banana yarn and 2 different textured silk yarns. The latest CPS - issue 12 - arrived about 4.30pm just in case we were looking like we had finished the posting. We did get quite a few out in the mail which those lucky people will receive on Thursday but the rest will go on Thursday. 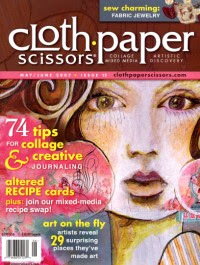 It's another excellent issue - there is an article by Jacinta Leishman with her fabulous embossing on velvet and lots of other good reading. Even an ad for my book - now that IS pressure. 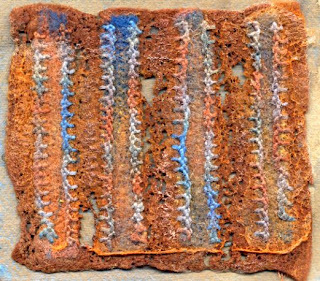 This is my Palestrina stitch sample - working in my rusting colours. Embellished background with chiffon and gossamer fuse over the top and I forgot it was kunin felt when I zapped it all so the stress holes are a bonus. Dreadful night - dreadful refs - both the Hurricanes and the Force were beaten. That's all I can say. May the best team win the finals of the Super 14s. Roll on the World Cup. At least I got lots of hanks wound and some stitching done. Just so you know I didn't spend all of my holiday reading and swimming - this is my rust book started. I took a bag of stuff to play with but I didn't want to make too much of a mess and anyway the iron gall ink had the nerve to leak and I cleaned up some of the mess with the white (of course) face cloth.... I can tell you it doesn't readily wash out. I have a stitched piece to add to the front cover but I need to finish it first. Today I have been spraying tags with a few of my Moonshadow Mists and I put tissutex underneath to collect the surplus and I have this wonderful piece which looks better than the picture. I hope to get working with it tomorrow. I have set my Playways people a new challenge - I promised them ages ago but days kept dancing by. Tomorrow I will email all the people who emailed me about the challenge I want to start next month hopefully. I have been putting it off until I got all my stuff for the book done. Ian didn't think it was a very flattering photo of him reading so to be fair I have to put up one of me and since they are never flattering (maybe it's me), here it is. This is the little section of the window seat where I was able to sneak on to from time to time. Also while we were away the Hurricanes won last Friday - yeah - in for a chance maybe and Ian's team lost although Bruce thought the Aussie ref had it in for them - no names mentioned. 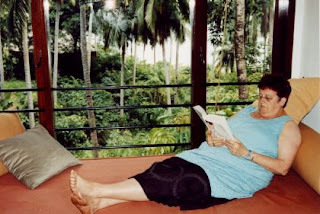 Here's Ian relaxing on bintan Island - this was his indoor reading possie. The pineapple was very fresh and tasty and you can see some plantain (little bananas) as well. I don't like these so much- we used to have them growing in our last house. The view out of the window looked down to the sea- we were woken very early by a gaggle of very singing birds and we had all sorts of wildlife. A couple of resident bats hanging in our outdoor area every night and squirrels running around. 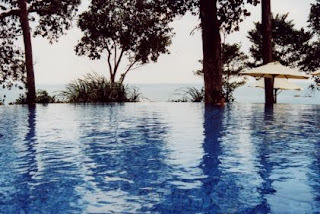 We have just had a wonderful long weekend at the Banyon Tree on Bintan Island, just off Singapore. You catch a ferry from near the airport and it takes about an hour. We went on thebirthday package - I must remember to fly more often on my birthday - these dour customs people suddenly treat you as a human with a name. We went on the birthday package which meant a bottle of sparkling wine, a birthday cake (with candles brought by a lovely man who sang happy birthday....), breakfast included each day. We swam and read and Ian now looks like a pink lobster. Very very relaxing and a whole weekend without working. I read lots of books and got started on "Death in Brazil" by Peter Robb which is wonderful reading. This is our bed on the last night with orchids scattered all over it. Very spoilt indeed. This is my bonnet stitch sample. I have to actually practise these stitches as I haven't used them before but once I got in the rythym they become somewhat addictive. Tomorrow is my birthday and we are off early in the morning to Bintan, an island off Singapore, for some r and r. Be back on Monday night. We decided that since we work every weekend we would have a real one off - first up planned to go to Bali until the Garuda plane crash and then I scoured the internet looking for somewhere we could get to without flying for hours. We are going on a Birthday package which means champagne on arrival or something. Plan to swim, read and do very little although I will be checking emails if only to clear all the spam but I will also answer anyone. I have packed my sketchbook and stitchy and marky sort of stuff to do some experimenting and catch up with the TAST stitches. I am a bit vague now that I have finished all my part of the book. The book should go to the printers next week and as soon as it does we will take preorders. nothing in the Perth papers at all and it was such a lovely sight on the river and so much a part of the sailing heritage of this state. Would have been a nice change from pages of aussie rules. That's Grant at the helm of Australia - mothers can do this sort of thing. He has whirlwinded in and whirlwinded out and I think I've worked out we won't see him again until the end of October. 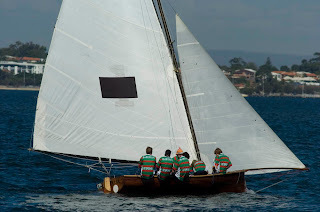 We have spent a bit of time at the Perth Flying Squadron watching the replica 18ft skiffs sailing and I have found a wonderful source for photos so I will be going back to take a whole lot and also taking my sketchbook etc. Yesterday it was very windy and we got quite wet out on the jetty watching the race. Unfortunately Grant's boat capsized and once that happens, it's all over rover. So we went home. Today was much calmer and they had a super race. All bar one of the races was a handicap race - the boats are different depending when they were first made. Grant's one - Australia - was originally built in 1946. Seems the oldest ones went off first. They were fascinating to look at. Anyway they had a wonderful race and ended up 3rd by a whisker. 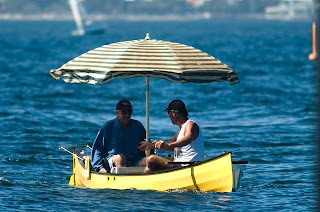 If they had been 2nd, they would have won the regatta. 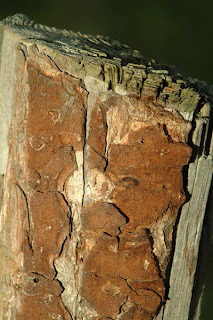 Incidentally , I have a fabulous cd made by Gwen Hedley called Surface and Structure - loads of great images of rust and stone etc - good visual resource for the moment. Well I am still a week behind but this is my knotted cretan sample. It's an interesting stitch for good coverage and you get into quite a flow. 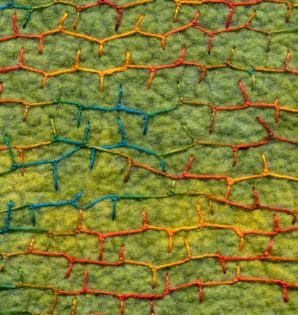 I like using lots of these stitches in a meandering way. Looks like rain - you never know your luck. Well the Force got well and truly annihilated by the Crusaders this afternoon. 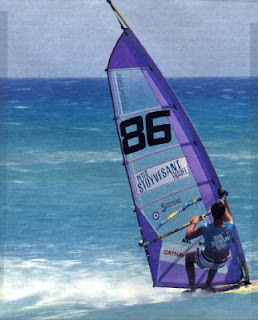 Only hope Grant ended up better on the 18ft skiff - he was coming 2nd when we last saw him. Magnificent yachts. Not the originals but replicas of the originals. They looked fabulous on the Swan River. There are 8 skiffs here from Sydney - pity there wasn't more promotion (or any promotion) although there was a channel 7 helicopter floating around this afternoon. Glorious time of life - these old boats - no desperate speed although 2 boats going along together always constitutes a race, relaxing - no mobile phones. All before the world became too hectic. 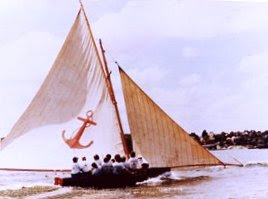 This is Yendys from 1924 - it must have been wonderful to see them out sailing on the Sydney Harbour. 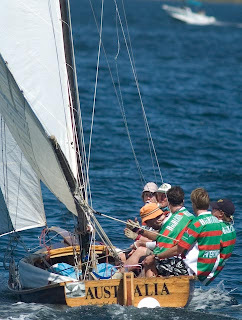 Grant is over from Sydney this weekend with a fleet of old 18ft skiffs - this is him at the helm of one. Aren't they wonderful? Bruce has been out all afternoon taking photos. Tomorrow we will go down and watch the racing. it's nice and quiet around here today - presumably everyone has gone south - very good. I have been experimenting with layers - this is all on the embellisher - I have been exploring the arches and walls in my Stones of Venice book and wanting to use the new inks I got. 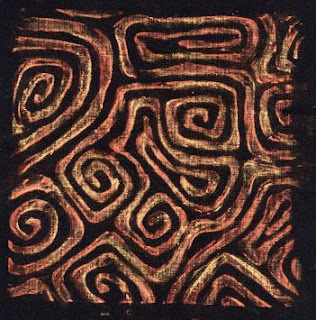 I painted Tissutex with dragon's breath ink and gall iron ink and sprayed walnut ink and moonshadow mist on the surface and bonded it to felt and layered it with fibres and stuff. Ironed Gossamer fuse on the top and applied more ink. Zapped with the heat gun and copper Treasure Gold rubbed over in places. There's a chiffon scarf in there as well. I am quite pleased with the effects. I still haven't had any reaction from the acrylic wax over a pva base yet, Lynda, but I didn't want to use it here. very busy winding up this book so my blog writing is down. Can't do everything. Okay so I am a week late but here is my couched effort. 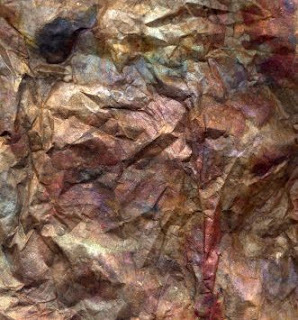 Hand dyed torn silk.